Club3D shows off the Radeon HD 7870 Joker, a new model that will start shipping in the second week of May. The card features a custom cooling solution but sticks to the stock clockspeeds, it has a 1000MHz core and 2GB GDDR5 clocked at 4800MHz. 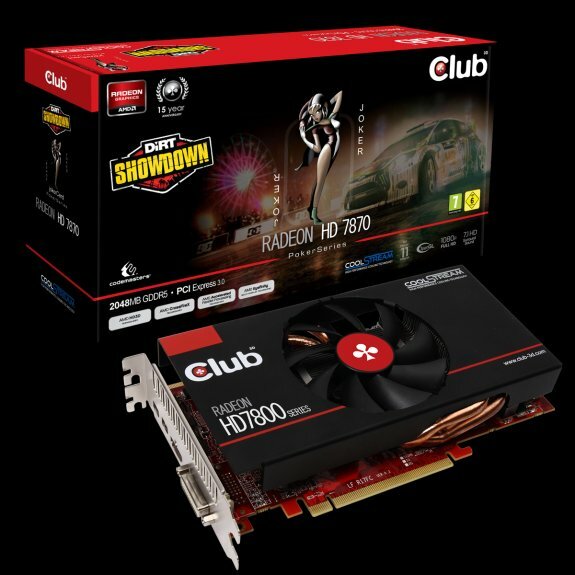 Club 3D proudly presents the Club 3D Radeon™ HD 7870 jokerCard graphics card. With PokerSeries Club 3D offers a new level of special gamecards that delivers the best performance, newest features and best coolers. The jokerCard present our highest demands. Get ready for the future with 28nm GPU technology, Graphics Core Next Architecture, AMD App Acceleration and support for Ultra HD 4096p resolutions and PCI Express 3.0. If you expect above average performance of your Graphics card, Club 3D CoolStream High Performance Cooling Technology is just the kind of high performance that you have been looking for. Club 3D CoolStream features high performance heatpipes that keeps the components cool and outperforms standard cooling solutions. Transferring heat from the center area to each fin, ensuring enhanced heat dissipipation. The result is a dramatic increase of performance for your gaming and multimedia experience. Experience stunning visual environments and an ultra-realistic multiplayer motorised mayhem with DiRT Showdown, a full version of the DiRT Showdown game will be included with Club 3D Radeon™ HD 7870 jokerCard graphics cards.